Summer is coming, with all the good, and all the bad. There are a lot of things to look forward to in the summer months, but when you’re living in or around the Tampa Bay area, you’ll be the first to know that it can get very, very hot. Florida summers are nothing to be trifled with, which is why it’s important to be aware of your air conditioning replacement, maintenance, and installation needs in your home. On most days, the Florida sun can be punishing, and the only refuge you’ll have from it is the sweet grace of air-conditioned buildings, your home being the one you’re going to spend the most time in. That means you really want to avoid having a defunct air conditioning unit. HVAC professionals require professional certification to be able to work in the industry. Do you think that would be necessary if anyone could just learn whatever they need to know in a few minutes of online videos? The truth is that one mistake in air conditioning repair can cause failure in the entire system, so you have to know what you’re doing. One of the most well-intentioned mistakes that people make in DIY jobs is taking a tremendous amount of time to do a job in the interest of saving money. What people often forget, however, is that time has its own value, and when you do long-lasting DIY jobs, you’re often saving money on paper but wasting far more time that could ultimately be used for more productive (or profitable) pursuits. In what could take you days or weeks of learning, an HVAC professional could do in mere hours, often even less. Another costly mistake in DIY jobs that often ends up costing more money than you save is neglecting the monetary value of tools and resources that you’re lacking. While it may seem appealing to forego professional treatment to save a few bucks, you might regret it when you realize how much you’ll spend on equipment, especially if you don’t get it right on your first shopping run. HVAC contractors have everything they need for every job, and they also have a comprehensive understanding of every air conditioning system under the sun. Whether they’re performing air conditioning installation, repair, or general maintenance, they will have everything they need. This not only saves time, it saves you money. If you’re in or around the Tampa Bay area, or in surrounding regions such as Pasco County or Hillsborough County, Benjamin Brothers is the HVAC company to call. 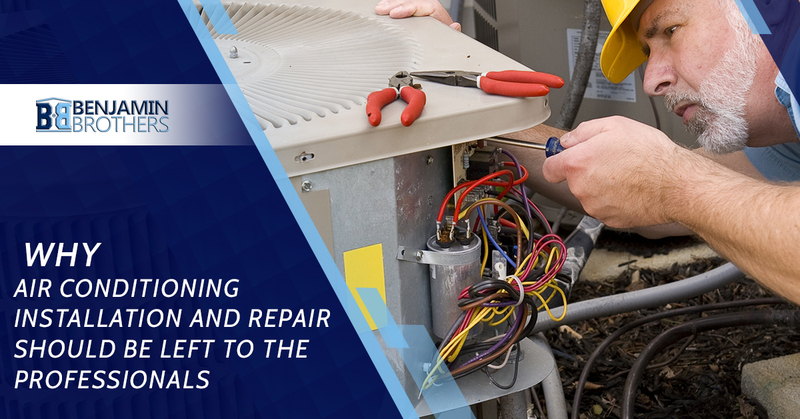 We have years of experience with air conditioning repair and replacement, and we would be happy to serve your system in the summer months when you need it the most. For a free quote, contact us today!